In recent weeks journalism and the future of all media have once again gone under the knife. Experts on either side of new media debated whether or not Twitter’s CNN moment truly was indicative of the future of journalism. In recent weeks journalism and the future of all media have once again gone under the knife. Experts on either side of new media debated whether or not Twitter’s CNN moment truly was indicative of the future of journalism. Twitter’s role in the spread of online dialogue speculating the death of Osama Bin Laden was studied at great depths to better understand when and where news actually surfaces, how it’s validated, and how news travels across the Web and in real life. 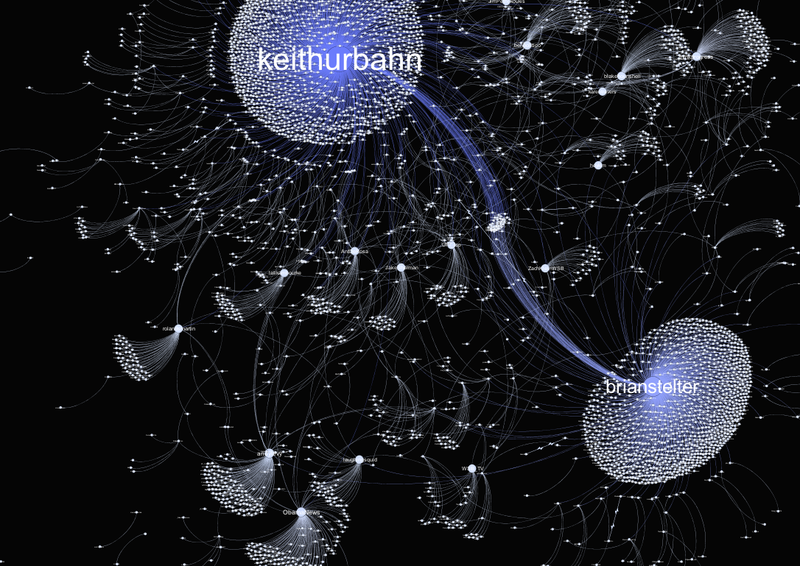 Perhaps nothing visualized the power of a single Tweet with such dramatic effect as the network graph developed by SocialFlow. Twitter is becoming a veritable human seismograph as it measures and records events as they unfold. But for this discussion, I’d like to focus not on the future of journalism, but instead on human behavior and the reality of the social effect. In doing so, we will identify the click paths and the sharing patterns of the informed and connected to learn how to design vibrant information exchanges on the traditional Web as well as in social networks. In hindsight, the days of Web 1.0 seem like an era long gone. I think back to the early days of the Web and I struggle to think about what fashion, cars and popular music thrived as the Web radically transformed the then information economy. It’s as distant as the behavior that embraced it. For many, Web 1.0 was empowering. But to access information, we were reliant on our willingness to visit desirable websites for insight, entertainment, and news. Home pages, bookmarks and email subscriptions helped people manage the information overload that overwhelmed consumers with so much great content. Over the years, portals helped us manage the content by aggregating content from the sites and topics we preferred. We were then gifted with RSS feeds and readers to enhance the way relevant information found us. 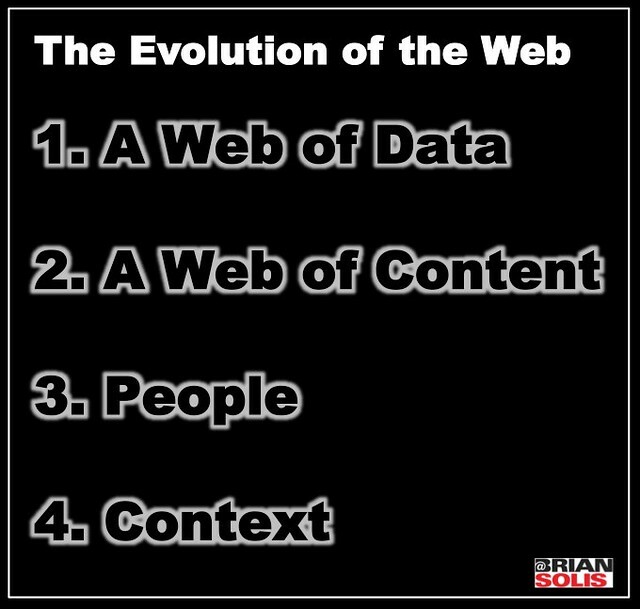 The bridge between Web 1.0 and Web 2.0 was forged through a series of connections between a Web of Data, a Web of Content, and a Web of People. Although abbreviated, this evolution is important as it sets the stage for where we are today. Web 2.0 is the great democratization of the Internet. Everyday people were empowered to create as much or more than they consumed. Among the greatest transformations in the history of media, traditional sources of information were now rivaled by new voices. These rising pundits, experts and authorities seized the opportunity to create content that satisfied the needs of an audience who were hungry for vertical and dedicated content. As a result, the construction of new information networks strained the long-established relationships between push or broadcast content and market demand. The tipping point for this orthodox practice was reached long ago yet media is now just realizing its effect, potential, and also consequences. It was the beginning of the end of business as usual for the conventional media empire. The transformation of media was only hastened as the Social Web fused the principles of Web 2.0 fostering social networks where people connected with one another to communicate, discover, share, and learn. Social networks carried a profound challenge and opportunity for media and information commerce. Leading networks essentially cannibalized attention as they rapidly evolved into a universal portal and information exchange. People now received news and important information based on who they connected to, what captivated their attention, and in turn what they invested back into the community. This important shift signaled the end of the destination web as the primary source for information and the revival of the information economy. Individuals connecting in social networks exchanged information as a form of currency. When news broke or events transpired, it became commonplace for a traditional news outlet to dramatically amplify reach as the story reverberated from person to person and network to network at the speed of clicks. And those clicks carried a power that we’re still trying to grasp, the ability to, with just one click, imply endorsement, evoke trust, interrupt attention spans, and alter courses of action through a one-to-one-to-many network effect. CNN greatly benefited from this new distribution model when its Balloon Boy story hit Twitter, soared to the top of the Trending Topics list, and continued to permeate the social web for days to come. While content long celebrated its reign at the top, context was now king and connections that formed the interest graph would now dictate the content introduced within it. As the social web matured, it would introduce a new form of information brokers who would further propel the information economy and its role in culture and society. The role of curator would emerge between creator and consumer to facilitate the exchange of relevant information within their networks of relevance and among their interest graphs. 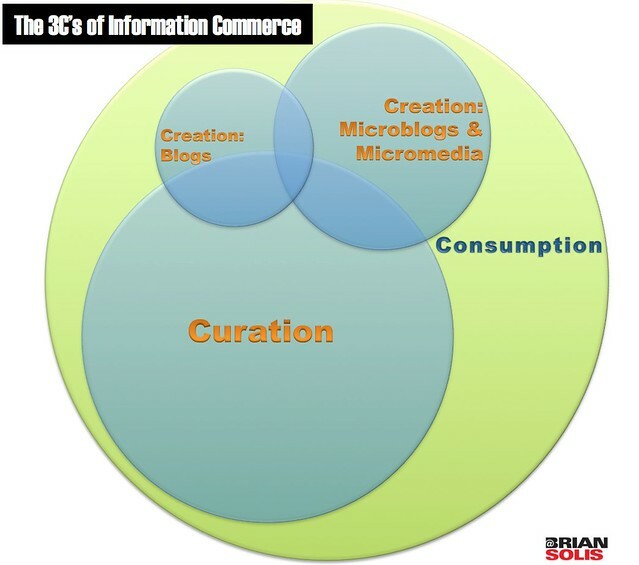 I refer to this phenomenon as The 3C’s of Information Commerce and it is triggering the development of new technology, networks, and platforms to empower curators to bridge material content to those seeking it. Retweets, Likes, connected commenting systems such as Disqus, Facebook, and Echo, URL shorteners, curation networks such as Paper.li, Pearltrees, Scoop.it and Flipboard, along with any other social sharing button you can imagine now served as the tools for curators to curate the experience they envision. Additionally, curation expedited the migration away from static web sites as a destination, as a well from which to bring water back to their village. Wells were now in greater abundance than their demand. Information is now portable and people expect it to find them. Here we are, learning to adapt in a market in transition. Online experiences continue evolve, but what’s clear is that there are three specific consumer segments that require unique support systems. This is where the future of media begins. By understanding that different people find, share, and interact with content differently, experiences can then be architected and information channels activated in ways that consumers expect. 1. 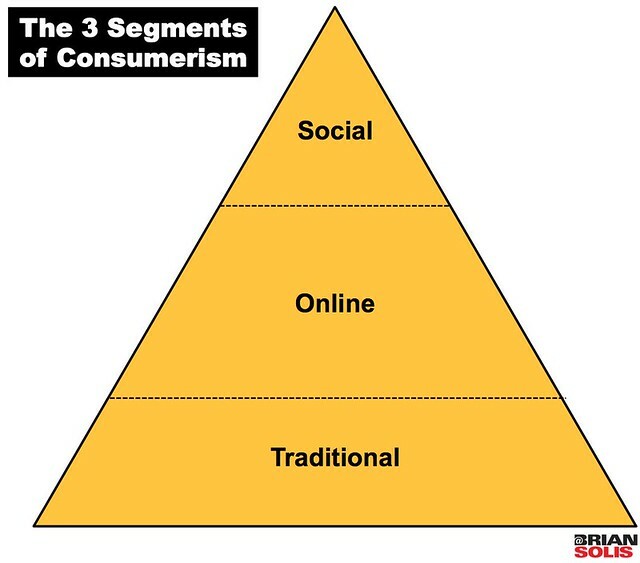 Social Consumer: Represents the emergent segment where consumers rely on social networks to discover, share, and learn. Doing so changes the click and clique behavior and how they in turn make decisions. 2. Online: The category that visits destinations of presence for continued information. This category also relies on Google as a point of entry for discovery. 3. Traditional: Consumes content in print, broadcast and remains loyal to their trusted and proven information sources, including word of mouth. They too will visit online destinations, usually those that provide tangible (and tactile) experiences and value in the real world. In a world where social, online, and traditional consumers live independent of one another, this market in transition is teaching us that the lines between each category are certainly eroding. The state and outlook for new media, in the very least, represents the equivalent of a near death experience for organizations. These encounters are nothing short of life-changing. They add a critical element of survival into the next steps of anyone who now realizes that things can and must be different. As such, destination sites are embracing new media as necessary steps to persevere. Many of these steps seem prescriptive as if following an instruction manual to relevance. The future of media is not limited to everyday consumers. Brands too are becoming media. Tom Foremski refers to this branded media movement as “Every Company is a Media Company” and EC=MC is the transformative equation for business. Once supported by brand advertising, media is now witnessing a new era of brand journalism that seeks to outperform and outreach the audiences that are for lease by today’s traditional networks. The market for information is now becoming rich with social objects that are designed not only for consumption but also for sharing. With the democratization of the web comes the democratization of influence. It’s now anyone’s game to become the resource and source for information related to a segment. Brands realize this and are experimenting with the establishment of nicheworks dedicated to their industry. Indeed the future of marketing starts with publishing. Companies are seeking new CEO’s (Chief Editorial Officers) and are hiring journalists, editors, and freelancers to transform mediarooms and blogs into veritable newsrooms. This move is as paramount as it is transformative. There are several reasons why the stars are in alignment for brand journalism. 1. Social consumers are no longer captivated or enticed by traditional advertising. 2. According to a recent Edelman survey, trust in peers is falling while trust in experts is soaring. It is the latter that holds the greatest promise for brands and any media network. As social networking evolves from social graphs to interest graphs, connections also evolve from relationships to relations weighted on the value of the currency exchanged between them. In this case, currency is information and value is measured by insight, education, entertainment, further personalized at the individual level. While the market for content is commoditized, the market for insight is limitless and priced accordingly. In Engage, I introduce the concept of an Attention Rubicon, the line where attention is in short supply and whether people realize it or not, its state is measured by what reaches them, what doesn’t and also what they deem worthy of sharing. The Attention Rubicon has long since been passed by the social consumer and is on the horizon of many online and traditional consumers. It will be crossed and as a result, the information economy will adapt. Pew Research Center’s Project for Excellence in Journalism published a study that further details the shift away from the destination web and the rising tide of social streams as the attention dashboards of an important class of consumers. This is why social media has never been about the technology as much as it has been governed by social science (2007) to better understand its state and its direction. As discussed earlier by the 3 Segments of consumerism, Pew found that there is not one group of news consumers, but in fact several. And as a result, news organizations or any organization for that matter, require unique strategies for addressing each audience. It’s clear that social networks aren’t a fad, they’re not going away, they’re in fact rivaling the top referrers for site traffic. The top brand news sites depend greatly on “casual users,” people who visit just a few times per month and spend only a few minutes at a site. As Pew notes, online data tend to count some users multiple times, inflating the number of casual users and undercounting repeat visits. Nonetheless, casual users still would be the largest single group. A smaller core of loyal and frequent visitors to news sites, called “power users.” These individuals return more than 10x per month to a given site and spend more than an hour there over that time. Among the top 25 sites, power users visiting at least 10 times make up an average of just 7% of total users. That number ranged markedly from as high as 18% (at CNN.com) to as low as 1% (at BingNews.com). Google remains the primary entry point. The search engine accounts on average for 30% of the traffic to these sites. Of all social networks, Facebook in particular, is a powerful, and growing, news referring source. At five of the top sites, Facebook is the second or third most important driver of traffic. Surprisingly, Twitter barely registers as a referring source. In the same vein, when users leave a site, “share” tools that appear alongside most news stories rank among the most clicked-on links. News consumers to the top news websites are on par with Internet users overall. This stands apart from news consumption on traditional platforms, which tends to skew older, and may bode well for the industry. The future of media is evolving and its direction is far from certain. What’s clear however, is that any media organization or business will have to compete for attention in this information economy in real time and over time. This is about competing for the future by competing for the moment. The consumer of the future is visible today as they’re always on. The interest graphs they weave within social networks serve as qualified information networks that can amplify information with unprecedented speed, efficiency and personalization. It creates a human algorithm that brings to life an awakening and revolutionary reality; we are now reaching an audience with an audience of audiences. They’re no longer consumers, but stakeholders in the information economy.